From Good Smile Company. 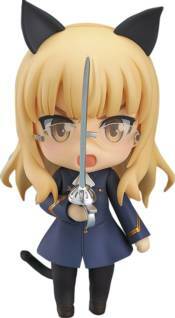 The tenth Nendoroid from the Strike Witches series is Perrine Clostermann! She comes with three expressions including her standard smiling expression, a fearless combat expression and the embarrassed expression she sometimes suddenly gets. Optional parts include the Bren Mk. I machine gun, effect parts to recreate her 'Tonnerre' magic ability and the VG39 Bis Striker Unit with both spinning and stationery propellers as options. The cat ears and tail she gains while flying are also included as fully interchangeable parts. Last but not least, the rapier she keeps as a family heirloom is also included, allowing for all sorts of scenes to be recreated in Nendoroid form!